After doing a guided meditation to prepare for my upcoming birth, I was inspired to make a painting using imagery from my experience. The image is a pregnant wolf with the Sh’ma painted around the border “Hear Oh Israel, the Lord our God, the Lord is ONE!” and the “ONE” is coming from out of the wolf’s mouth. The baby wolf has a blue gem glued to it’s belly. The red parts are going into and coming out of the wolf, and also surround the wolf. An arm cradles the wolf at the top, coming from the red, like the red shape is the womb of God in which the wolf is being cradled. 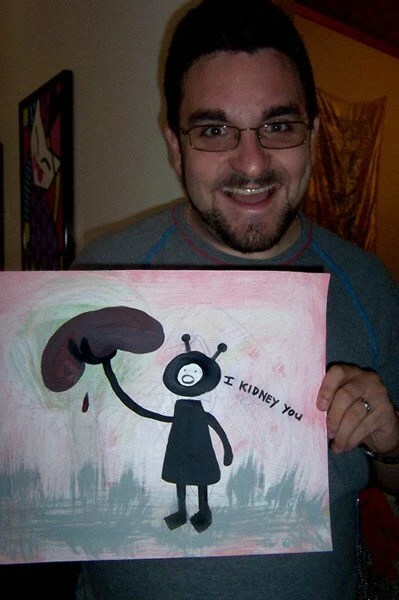 Custom-made Bizarre Paintings for Awesome People! This painting has a meditative feeling, and depicts a woman deeply connecting with the natural world around her. 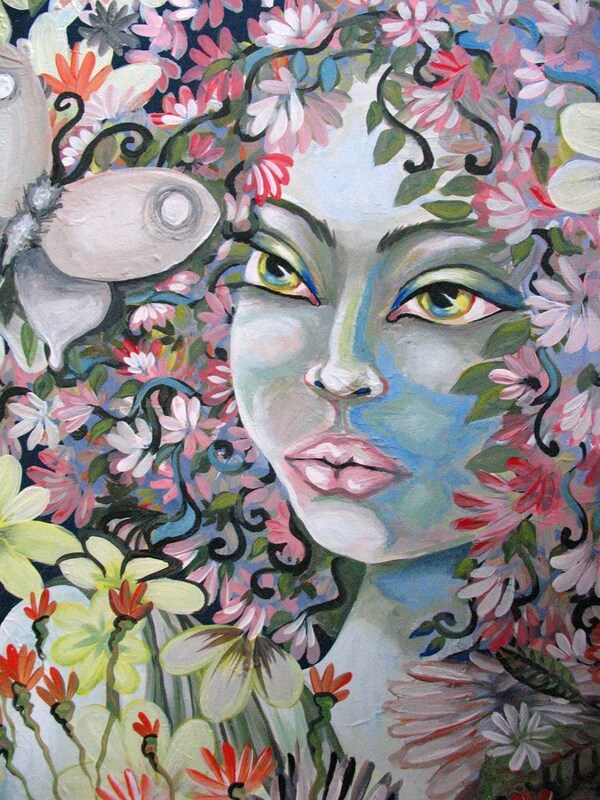 She is attuned to the spiritual aspects of nature, and has a blissful look in her eyes. I made this painting while fasting on Yom Kippur, and listening to Krishna Das. This interesting combination produced a uniquely mystical painting and a feeling of new beginnings. This drawing depicts a woman deep in meditation or prayer, connecting with the natural world around her. 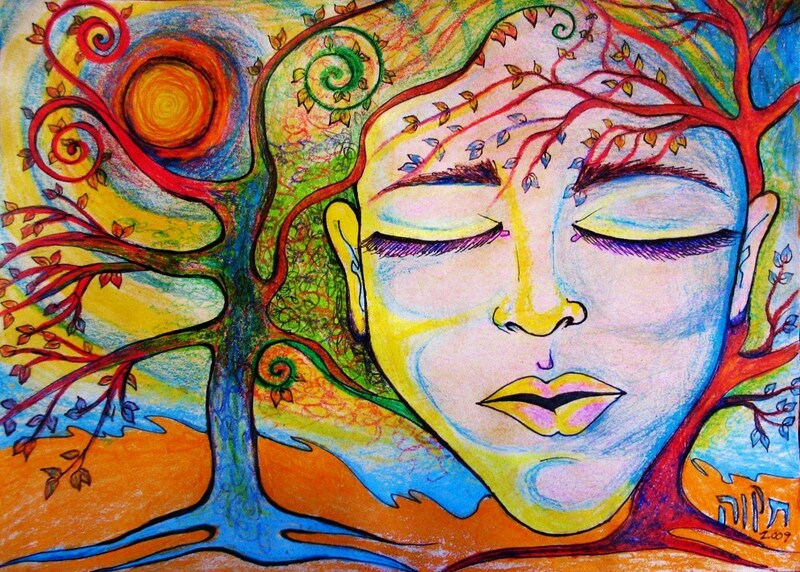 The trees and the sunrise are one with her, twirling themselves into the curls of her hair. This drawing was inspired by the Hebrew Sh’ma prayer: “Hear, Oh Israel: the Lord our God, the Lord is ONE!”, which I interpret as meaning that God is one, all is one, all is God! 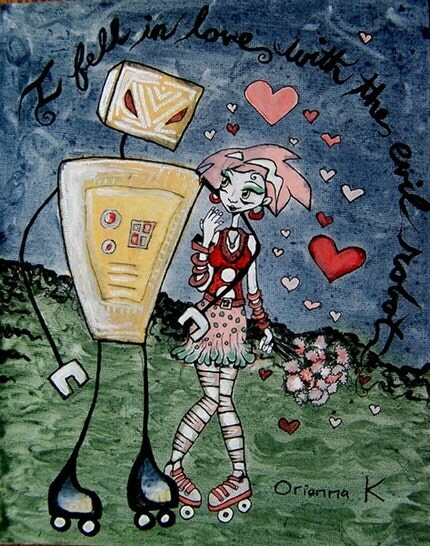 This playful painting is about unreciprocated love, or falling in love with someone who is emotionally unresponsive. The girl is gazing lovingly into the robot’s cold steel gaze, unaware that he will never become a cuddly creature. The robot has painted silver accents which have a metallic shine when light hits them.